The quality of the models seemed ok for a miniatures game, how much detail does one really need on a table top, I’m not sure, it’s a whole new world to me still, so not too fussed at this point. The only issue I found was with the right side tracks on the Sherman V’s. It did not fit squarely on the chassis and required a considerable amount of trimming to make it sit properly. If you find this to be the case with yours, be sure to visit the Flames of War page on how to assemble the Sherman V which also mentions this fault. With models, you always want to check how things are going to go together and fit before you apply any glue and commit yourself. The above mentioned fault made what would’ve otherwise been a simple and quick process slightly painful. 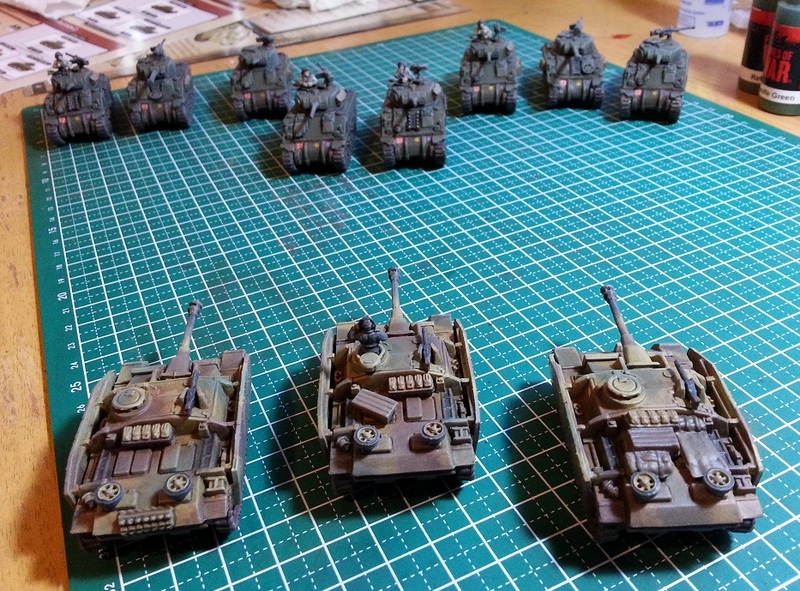 The Stug’s were quite easy to assemble and were ready to paint in no time. The nice feature of the Sherman’s was the magnet connected turrets, so they can turn but also can be removed and replaced by smoke in the event of being destroyed. Once assembled, a quick spray of primer and the tanks were ready for painting. Having done some modelling in the past I already had some Tamiya paints in stock. 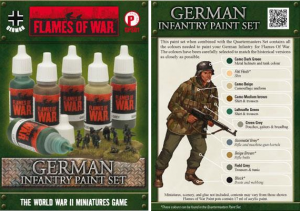 However I’d not done anything in the way of tanks before, so my colour options were limited and I decided to purchase the appropriate Flames of War paint kits to get the job done. 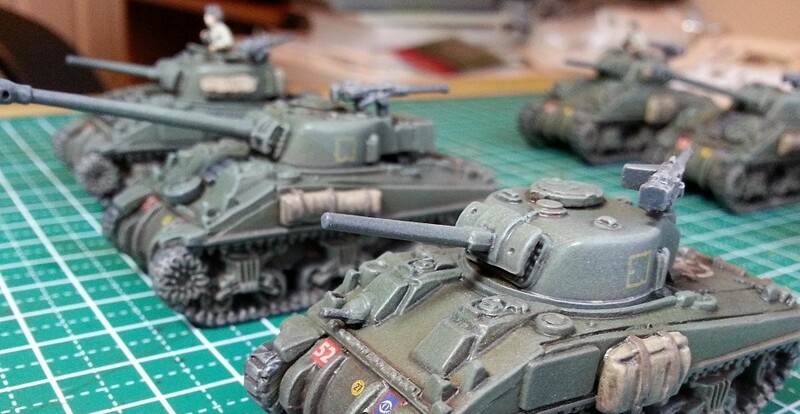 My immediate challenge with painting these tanks was that I had never painted anything quite so small before. On the other hand, painting them should have been relatively quick given the size. 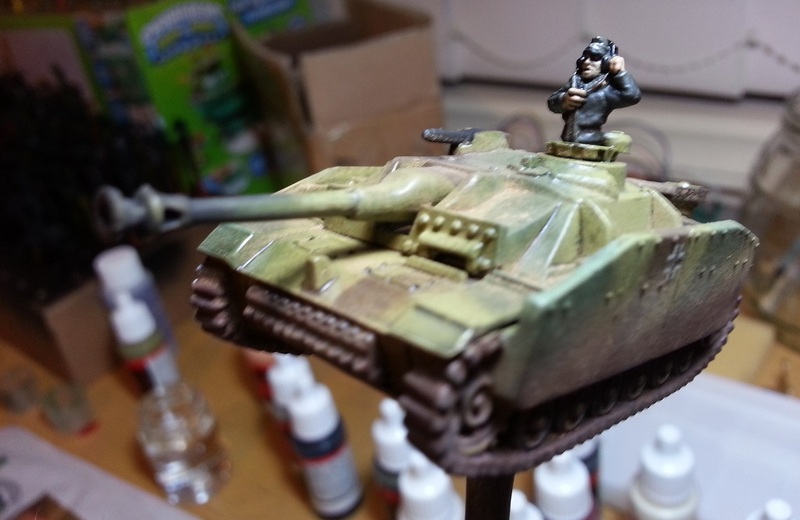 After watching several videos of people painting and weathering models as well as the official Flames of War tutorial videos, I decided to hit it with the airbrush, which I found slightly difficult when trying to paint the camouflage scheme on the StuGs. While I struggled to get it to spray fine enough and narrow enough, I did mange to do the job. Not overly impressed with the final outcome, but given the size and not having airbrushed much in the past, it was a pass. After applying decals, wash, pigment and slightly poor attempt at dry brushing, we had a completed StuG with commander in his place. By comparison, the Sherman looked like a fairly straight forward paint job, with just the single colour. Except I thought it would be cool to apply to the tanks the various accessories. Sure they’re cool, but would obviously require more effort to paint, and there are soooo many Shermans. But, before I knew it, the production line was coming along nicely, and while painting the wheels and tracks was fiddly and time consuming work, it was fun seeing these little things slowly come together. 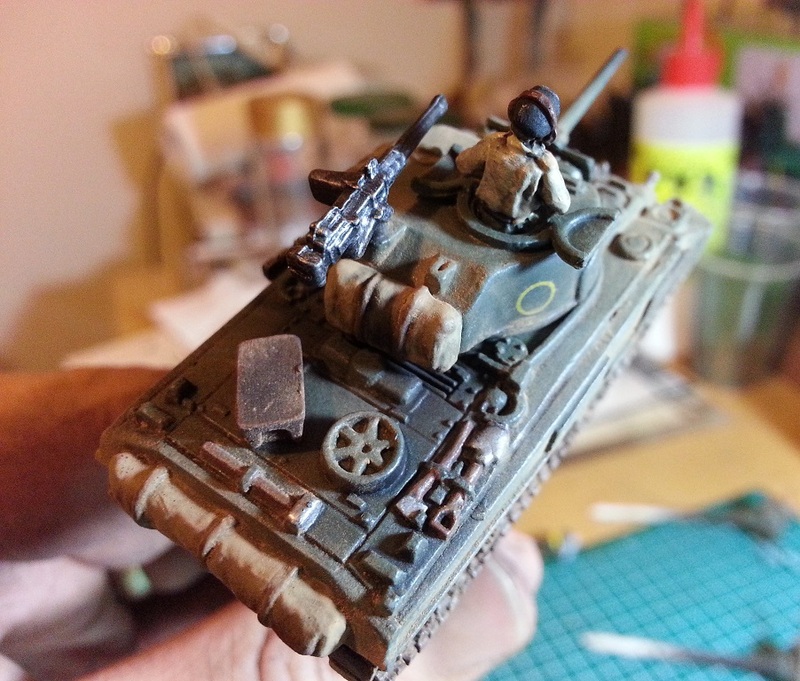 Again, with a bit of wash, pigment and decals application, the Shermans rolled off the production line. The two armoured forces were complete. Next, the troops! This entry was posted in Gaming, Miniature Wargaming and tagged flames of war, miniature, war gaming. Bookmark the permalink.